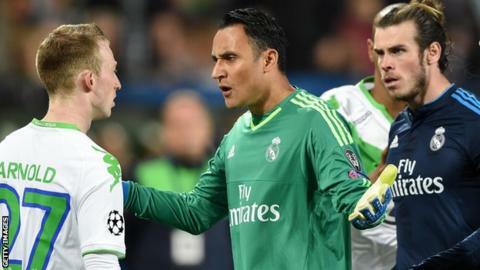 Both Wolfsburg's Max Arnold and Madrid's Gareth Bale were booked following Marcelo's play-acting. Real Madrid defender Marcelo has been called "an actor" for his antics in their 2-0 Champions League quarter-final first-leg defeat by Wolfsburg. The Brazilian appeared to thrust his head towards Wolfsburg midfielder Max Arnold's midriff, before going to the ground, clutching his face. Arnold was given a yellow card, while Marcelo was not penalised. "Marcelo is an actor," Wolfsburg manager Dieter Hecking told German media after the game. "That annoyed me, because he has no need." Marcelo will face no further action from Uefa. European football's governing body would only act retrospectively if the incident had been missed by match officials. Swiss full-back Ricardo Rodriguez opened the scoring in the first leg with a penalty, before Arnold struck the second. The return leg takes place in Spain on 12 April. Marcelo's play-acting was described as "embarrassing" and "disgraceful" by former England manager Glenn Hoddle. His fellow ITV pundit, ex-Manchester United midfielder Roy Keane, called the Madrid player's dive "shocking". Arnold, who described his side's win as "breathtaking", simply said of Marcelo: "I wish I had such beautiful hair too." Reaction - worst dive ever? Thursday's Sportsday is asking for reader's best or worst dives - get involved via #worsteverdive or on BBC Sport's Facebook page. Marcelo's theatrics were ridiculed on social media and drew comparisons to his fellow Brazilian Rivaldo's play-acting in the 2002 World Cup. The former Barcelona forward feigned injury when the ball was kicked towards him by Turkey defender Hakan Unsal, leading to Unsal being sent off. Rivaldo was later fined more than £5,000, but escaped a ban and said he had no regrets about the incident. Others pointed to the fact that Marcelo's manager Zinedine Zidane, was famously sent off in the 2006 World Cup final for France against Italy for an actual headbutt.